60 11th Street has achieved LEED Gold Certification from the U.S. Green Building Council. RJTR provided full architectural and interior design services for Daniel Corporation and Selig Enterprises for the prominent Sixty 11th Street apartments. 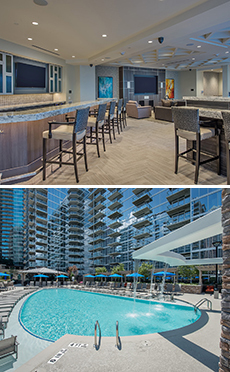 Nestled within the 12th and Midtown development at the corner of Crescent and 11th this multi-family mixed-use anchors the corner of one of Atlanta’s most sought after nightlife districts and boasts nearly 15,000 SF of vibrant retail space tucked beneath 20 stories of high-end luxury apartments. 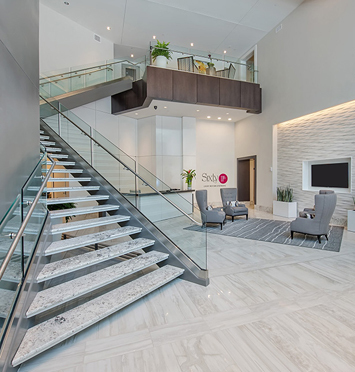 Residents and their guests are welcomed by an inviting two-story lobby, designed with contemporary lines, clean stone and wood finishes complimented by a grand staircase. The lobby design concept flows through the elevator cabs up into the nearly 38,000 SF of elevated amenities including a comfortable club room, game room, and an energetic fitness facility with an amazing city view. Large full height operable doors open up to the private sky deck including a saltwater pool with waterfalls and tanning ledges, private poolside pergolas, multiple grilling areas, covered poolside bar, and a cozy four sided fire place. Luxury units feature floor to ceiling glass, quartz countertops, and hard surface flooring throughout. Each unit is equipped with energy efficient lighting and controls in conjunction with other LEED Silver offerings. 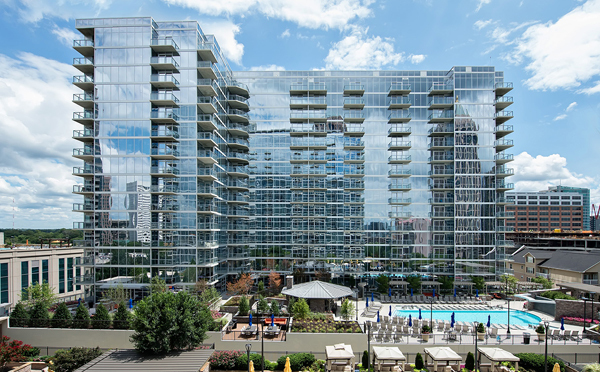 Floor plans offered range in size from studio, one, two, and even a rare in-town three bedroom unit, attracting all Atlanta lifestyles.